Boots and a bright denim jacket extend the life of a dark chambray sundress for an early September outdoor picnic and movie at dusk. 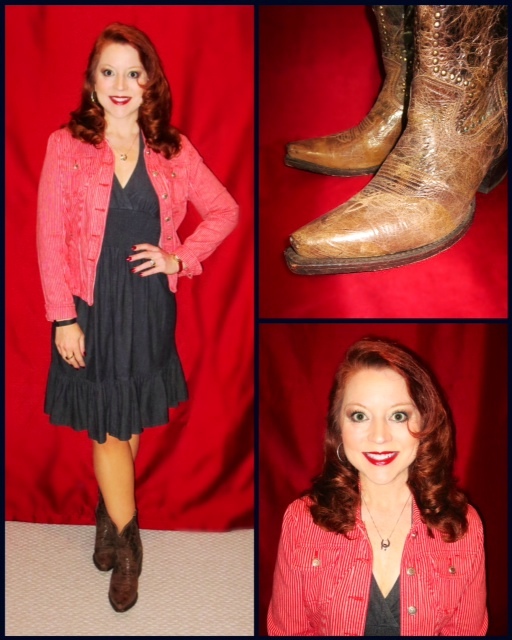 Dress and Jacket (Butterfly Consignment); Boots (Justin). Slinks off to Winter's bed. A sundress in autumnal hues felt just right for a warm Labor Day weekend at an outdoor Music Fest headlined by Michael Franti and Spearhead. Dress (Macy's); Bag and Hat (Nine West); Sandals (Lindsay Phillips SwitchFlops with homemade button detail); Watch (Fossil); Bracelet (Lenny & Eva); Petrified Wood and Silver Pendant (a gift from my fabulous mom).